Even if Lauren Bush never makes another album ever, she can comfortably secure her reputation on All My Treasures. The disc’s charismatic title comes from “I’ve Got Just About Everything I Need” evocative in its way, thanks in no small measure also to the arrangement by Don Thompson and Liam Dunachie (who also arranges everything else including “Feelin’ Alright” with Ian Shaw) and something that certainly prepares you for the music that is to follow. 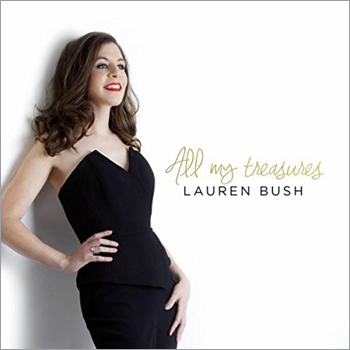 And there’s no wrong reason to lure listeners into the fantasy of each of the classics that Lauren Bush has selected to be remembered by and the instant acclaim with which she is sure to be greeted wherever she goes from here. All eleven pieces share a complete sureness in their respective musical identities that ensue – no gimmicky effects, no quotations from elsewhere, just going to the poetic essence of the text at hand egged on, undoubtedly, by a group of terrific musicians. There must surely have been the gently guiding hand of Ian Shaw, who has produced the album, but it would appear that he had his work cut out for him – certainly almost all of it. Not only Bush, but Liam Dunachie, Andrew Robb, David Ingamells, Miguel Gorodi, Brandon Allen and Kieran McLeod have ticked all of the boxes, dotted every “i” and crossed every “t” from ebullient to meditative. But it is the manner in which every emotion is felt which has determined the way in which it is ultimately sung; certainly in the case of Lauren Bush the songs have spoken – whispered in her ear at times – in “Dindi” and proverbially in “Secret Love” too – and shouted with joy, most memorably in “Doodlin’” and many more instances elsewhere. Best of all is the surefootedness with which Lauren Bush steps out each time she sings. Something special happens in “Sweet Georgia Brown”; the song seems to land in the angular, rhythmically vital world of Cab Calloway and then morphs into an overdrive version that recalls both Earl Hines’ big band version and the completely off-the-wall version that has followed the Harlem Globetrotters wherever they go. Meanwhile “You’re Nearer” is brilliant, and where some moments have cinematic shifts in instrumental colour as the words veer between imagination and near-hallucination, and from night-time darkness to bleach-out sunlight. Appropriately, of course, Bush closes out this oh-so-memorable album with a wonderfully funky “Feelin’ Alright” and as usual her musical instinct is absolutely spot on. Wow, Raul. Thank you so much for such a kind and detailed review! I’m blushing!